MailBot 9.37. Forwarding in O2.pl and WP.pl creators. MailBot account creator updated to version 9.37. MailBot also got its own YouTube channel. It already has useful tutorial videos for work, subscribe, so as not to miss new videos! MailBot account creator updated to version 7.85. All SMS-services API supported by MailBot are listed in the list “SMS service API”. When you select an API in this list, MailBot automatically populates the list of domains that support this API. You can still enter your own domain that supports the selected API type. 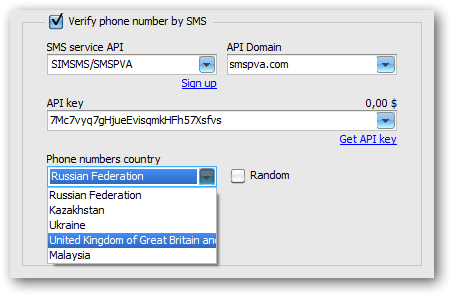 When you select a domain in the “API domain” list, the “Phone numbers country” list is automatically populated with the list of countries supported by selected SMS-service. If the “Random” checkbox is checked, MailBot will select a random country from the “Phone numbers country” list for each phone number request. MailBot account creator updated to version 7.61. Account creator of Polish email provider Onet.pl was implemented! Active POP3, IMAP and SMTP on onet.pl domain is at your service. You need to recognize one reCaptcha v2 to create an account on Onet.pl. MailBot account creator updated to version 7.12.